Sustainable seafood will provide much of the culinary inspiration for Simply Fish – an exciting new fish restaurant that has just opened in North London, and the first restaurant project from Christie Singham, a former lawyer. Executive chef Sherif Hassan, who has worked at Kensington Place and the Savoy and Cavendish Square hotels has conceived a menu where customers are invited to make their choice of fish, which they can then choose to have panfried, steamed, baked, battered or grilled and served with one of a selection of delicious sauces and accompaniments. They are all about seriously fresh and sustainable fish at this new eatery in the heart of Camden with daily deliveries from their merchants in Looe, Cornwall. But the concept of sustainability does not stop at the menu and the invitingly light, stylish interior has been created with the use of eco friendly, rapidly renewable Bamboo products from Smith & Fong. The exposed brickwork combines perfectly with the simple, stylish Bamboo tables and benches to create a cool urban feel and the Bamboo stools and countertops arranged in unconventional ways give the space a pleasing ambience. All fabrication work was carried out by Hertfordshire based 414 Timber and Joinery. According to Company Director, Mark Loughrey “Smith and Fong’s Bamboo products are so easy to work with and produce a top quality finish with a warm and beautifully natural look and feel. They were the perfect choice for this eco friendly concept and we are extremely pleased with the result”. The warmth and beauty of Smith & Fong’s Amber Edge Grain Bamboo was chosen for this contemporary design, not only because of its good looks but also for its green credentials. 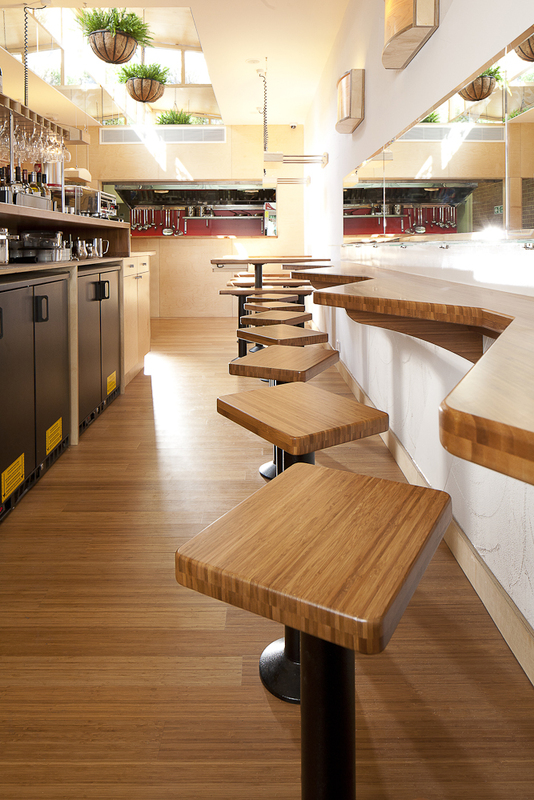 100% certified FSC Plywood was used for the furniture and countertops, whilst the worlds only FSC certified formaldehyde-free Bamboo flooring range, from Smith & Fong, provided the finishing touch. 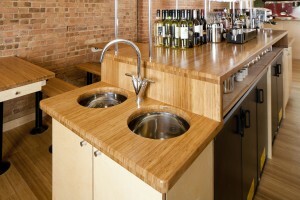 “Smith & Fong Amber Edge Grain Bamboo Plywood has long been popular among the Architecture and Design community for its performance, environmental and aesthetic qualities” commented Scott Campbell, European Sales Representative for Smith & Fong “and of course, having FSC certification ensures managed forestry”. Found in design rich environments worldwide, Smith & Fong has pushed boundaries through innovation and environmentalism and have created a product range that has something for everyone. “With commercial and residential projects today, it is so much easier to choose materials that embody forestry ethics and sustainability, says Scott “and I trust that the Smith & ; Fong product range will increasingly be a part of that choice”. 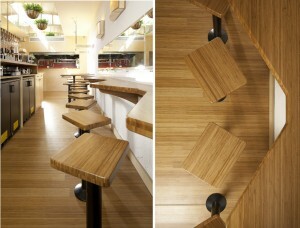 People are truly wowed by Smith & Fong’s ability to transform traditional Bamboo into a product that has an ultra-modern twist and with its uncomplicated design, the use of Smith & Fong Bamboo has gone into making this space perfect for food and conversations, creating a clean, fresh, stunning interior.